Stertil-Koni has introduced two new adapter kits for its inground scissor and piston lifts with the goal of making lifting buses and trucks more efficient by engaging the front and rear lifting points. Many of the newer trucks and buses have bigger and wider axels so they’ve tailored the adapters to meet these new requirement. 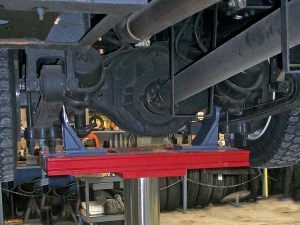 An adapter pairing has the capacity to accommodate up to 35,000 lbs depending on the type of lift it’s used with.